The 1998 climb was the 5th ascent (not counting the 96 climb). How to get there: This is indeed a very good question. North-East Greenland is about as isolated as any place on earth can be in todays world of fast and modern communications. Nobody lives there, there are no airports, the coast is blocked by the ocean ice flow from the arctic into the North Atlantic between Iceland and Greenland. Our approach followed that of Norwegian trappers that lived through the arctic winter in North-East Greenland in the first half of the 20th century. We left Longyearbyen at Svalbard (at 78 degrees north) on one of Norway's few remaining seal hunting boats, Polarstar of Ålesund in August 1996. The boat is classed for arctic sailing, including navigation in the arctic ice. We had charted the boat including a crew of seven for a period of about three weeks. The sailing across to Greenland took a bit more than three full 24 hour days, but this included a pretty bad storm during which we made no progress. On the other hand a storm should probabely be included in any realistic estimate. We arrived at Greenland at the Sabine island, just south of Shannon. The approach this time was almost equally expensive, but very much faster. A Twin Otter airplane from Iceland via the Danish airport Constable Pynt, then directly to the glacier north-west of Peterman. This airplane is equipped with skies and can land on most of the (flat) glaciers on Greenland. Route description: Day 1: Our starting point was the innermost point in Franz Joseph's Fjord, one of the longest and most impressive fjords on earth. The huge Nordenskiold Glacier fills the very end of the fjord and gigantic icebergs breaks of into the fjord. We got onto land just to the north where a valley, Knækdalen ends. The river in this valley was very small at the beginning of September, but it clearly shows signs of having more water at other times of the year. We crossed the river and climbed the fairly steep (perhaps 25 meter high !) riverbank on the west side. The hike from here to the almost ninety degree bend of the valley (from north to almost west, this is the origin of the name Knækdalen, which means `the valley with a distinct bend'). At this point one can scramble back down to the river and up on the opposite side which can be followed quite easily. Since the water was very low in the river, we actually hiked up along in the bottom of the canyon formed by the river. This is an interesting alternative, with almost vertical walls and numerous bends. The river can be followed until further progress suddenly is blocked by a small pool that fills the canyon, with the river cascading into it from above. Fortunately, one can quite easily climb out of the canyon near this point and continue on the northern side. At this point the valley completely changes character. 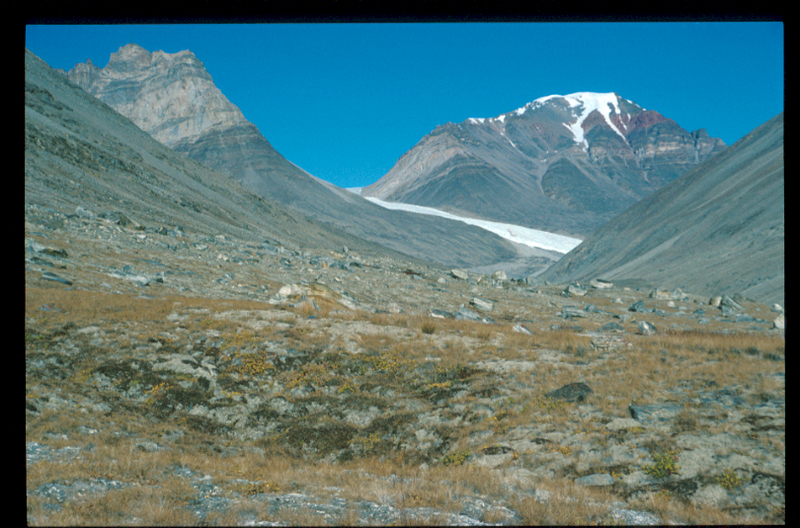 There is a small glacier that extends all the way down to the creek marking the end of a relatively narrow valley and the beginning of a typical glacier valley, U-shaped with a flat, smooth floor. We continued the hike here until near the end with the Gregory glacier nearby. Straight ahead, towards the west, the two impressive mountains Gog (2651) and Magog (2400m) dominate the view. If one turns north, one will climb easily to the Mystery Lake. This lake, which is marked as two lakes (upper and lower mystery lake) on the map, drains towards the north, separated by a low shoulder from our valley. The lake drains below a huge glacier (the Jätte glacier, meaning the giant glacier) and this most likely explains why the two lakes had merged into one. It is possible that an ice dam could even cause the lake to rise to a level where it would drain towards the south (into our valley). We put our first camp at this spot before getting onto the glacier the next day. Day 2: After a short hike we were at the very end of the Gregory glacier. 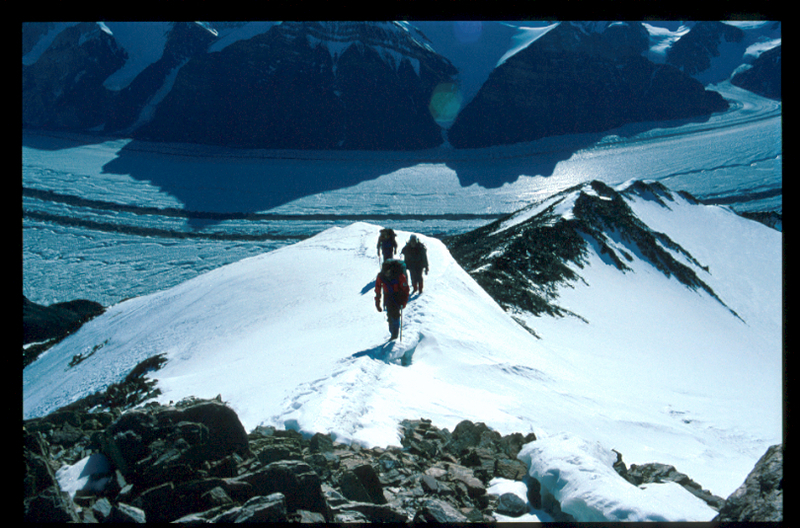 The climb up this glacier was straightforward, a fairly gentle climb on good ice for the crampons. Higher up the glacier becomes more flat and eventually also covered by a thin layer of snow. (This was early September, there were signs of more heavy water runoff from earlier in the summer.) The glacier climbs very smoothly in its valley with very nice mountains on both sides. In all respects, this certainly seems like the perfect route to Peterman from the fjord. About half way into the Gregory glacier we somewhat unexpectedly, experienced a `glacier crossing' as the Nathorst glacier cuts the Gregory at about a ninety degree angle. 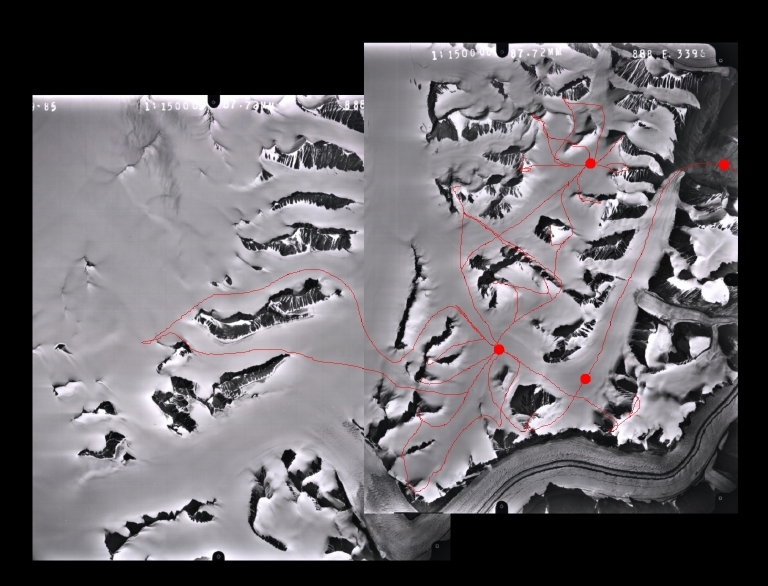 This is not at all noticable from the map, the Gregory glacier dips at this point and there are both more crevasses as well as a general jumble of ice and rocks in the area. Having passed this Gregory resumes its gradual climb with relatively narrow, but surprisingly many crevasses cutting across perpendicularly to our course. Peterman is visible for most of this hike, growing bigger and more impressive as we get closer. 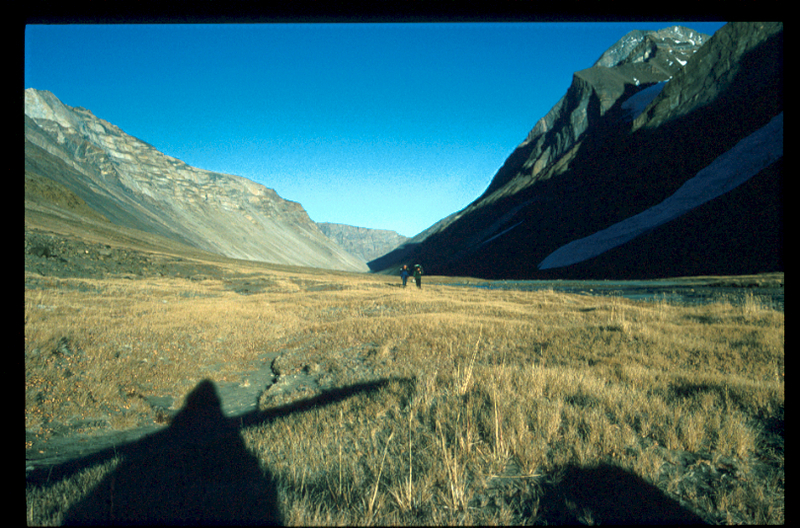 We established base camp north-east of the mountain with the last rays from the sun coming through the passage just north of Peterman. Day 3: We continued south of the mountain while climbing the lower snow slopes and eventually got a very nice view down to the Nordenskiölds glacier far below. The climb continued on the southern side and after lunch, we attained the south-west ridge which looked like a promising route to the summit. (We had done absolutely no research before this trip, none of us had read as much as a single line about previous attempts. As it turned out, this would have been helpful, since the last pitch of this route had caused considerable problems for the first ascent party of Wordie in 1929.) The ridge was mainly free of ice and snow involving only easy scrambles, but with a few snow ridges where crampons and care should be taken (spectacular cornices to the north-west). The final part of the ridge got steeper and quite ice and climbing with belays was necessary. Finally, we stood at the last visible rock with a sizeable ice cone in front of us. 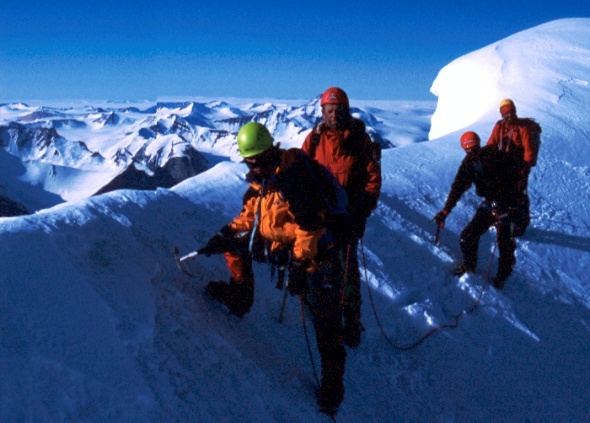 The time was already 19:00, the sun was low across the main icecap of Greenland, and our party was really not equipped for what appeared to be a about 60 final meters of pure ice climbing gaining perhaps about 25 vertical meters. I climbed one rope length (about half way) with a belay from below and using the two ice screws we carried. The ice cone drops abruptly off to the south-east, and the best route seemed to be quite close to this edge. At this point, it was clearly right, given the time of day, the experience and equipment in the party, and our extremely tight schedule to turn around. It was not without hesitation, turning so extremely close to the very highest point in North-East Greenland, the remaining section was no more difficult than the one I had covered, but it would have required my companion to move onto the ice as well and a couple of more ice screws would indeed have been useful. The return climb/hike back to camp was dominated by our fantastic views, the spectacular sunset, the crisp air and the strong feeling of being alone on the planet, with hundreds of miles to the next human being. We reached the tent at midnight under a sky filled with northern lights. Day 4: Our extremely tight schedule called for the boat to return in the fjord this evening to pick us up. In short, what was a heavy two day hike in had to be completed in a long day out. Yes, we did it, but I would not recommend it, the party was quite exhausted after an 18 hour return hike partly caused by the weather getting less friendly and fog making route finding on the final part more cumbersome. After several days with local climbs in the general area, we started out for Peterman from base camp around 1 AM in beautiful sunshine and with crisp good skiing conditions. We intended to follow the same ridge route as I did two years earlier. This time climbing onto the ridge from the opposite side. We got onto the ridge considerably further down, in fact at its very beginning where one has a very nice view down on the Nordenskiold glacier. The route was similar, but with much more snow, this time in mid June, compared to the earlier trip in September. Generally, the climbing was easier, in particular the last stretch before the final snow cone. The snow cone itself was however, steeper since it had a considerable accumulation of snow on the top. The climb up here which is a bit more than 50 meter was exposed and quite steep. The first part on hard ice, then on steeper, but good snow where steps could be made with the boots. The top itself had a huge overhanging cornice, so care was needed. It was hard to determine if the highest point was the rocky part or the snow cone, I would guess that the snow was slightly higher. Reading about previous attempts and climbs it is clear that a few more days would have been adviseable. 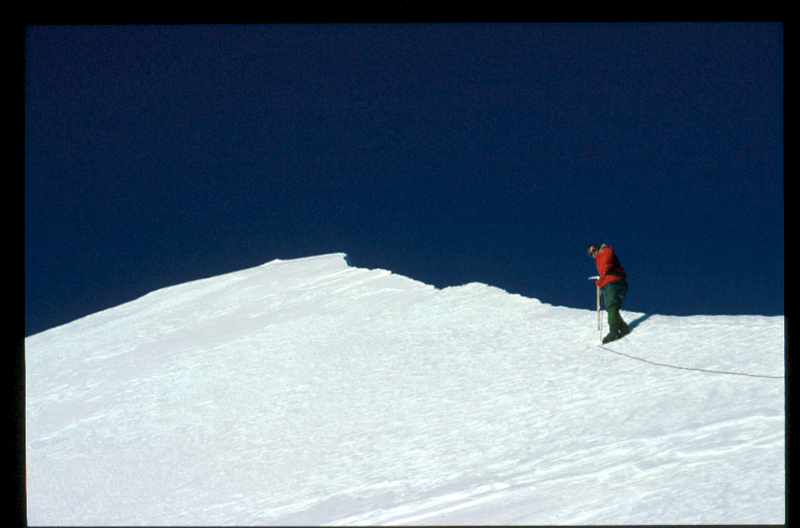 This was also originally the plan, but various delays earlier in our expedition had left us with only four days for this climb. Parties starting from the fjord should probabely allow six days in order to increase their chances of success. 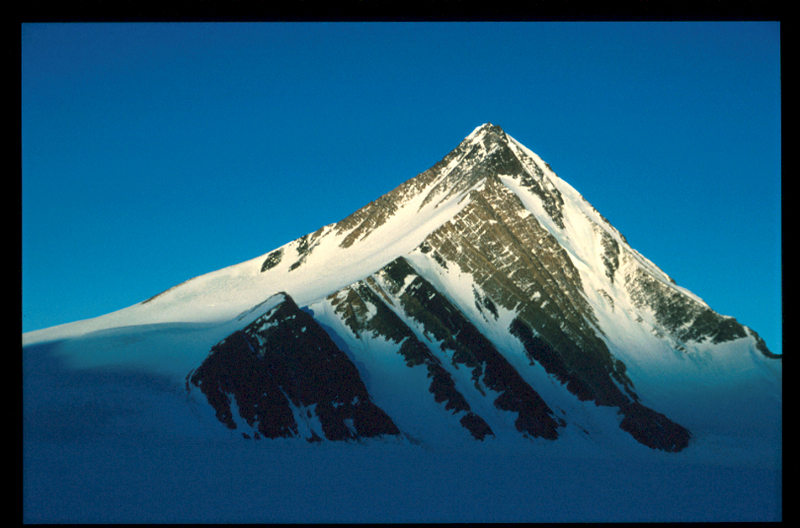 The base camp for a south-west ridge climb could also preferably be established higher on the mountain just below the ridge itself. This would allow more time for the climb. The climb was easier in terms of time required. We started much earlier, this is to be recommended in June as the snow got quite soft on the return. Soft snow on these slopes is a problem as it sticks to the crampons, creating a danger unless continuous attention to snow removal (with the ice axe) is applied. We got a good look at the upper section of the alternative route from the east. This approach looked quite ok, but do get the sun considerably earlier. The upper part looked like a steady snow climb. Camps and routes. This air photo shows a rough outline of camps and routes from 1996 and 1998. For more detail and comparison, check out the Google map on the main (entry) mountain page. Knaekdalen. This is the lower part extending up from the fjord. Knaekdalen. The middle part (the bend) is wild and somewhat difficult to hike. Knaekdalen. The upper part is very flat and nice. 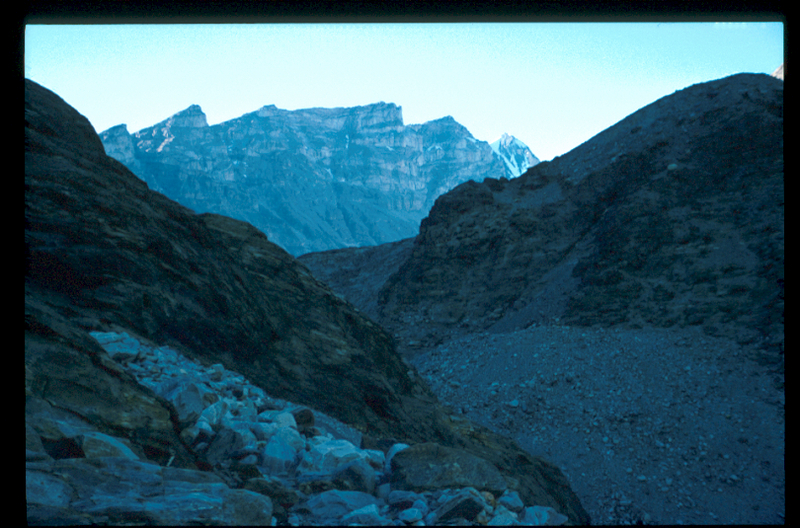 Peterman from our Base Camp on Gregory, morning September 3rd, 1996. On the ridge September 3rd, 1996. Higher on the ridgea day to be remembered. Me as high as we got. We were out of time and the remaining slope would have required careful belaying and ideally, more icescrews. The slope is not steeper higher up. 7 PM on September 3rd. 1996. Summit ridge view to the south-west, june 1998. 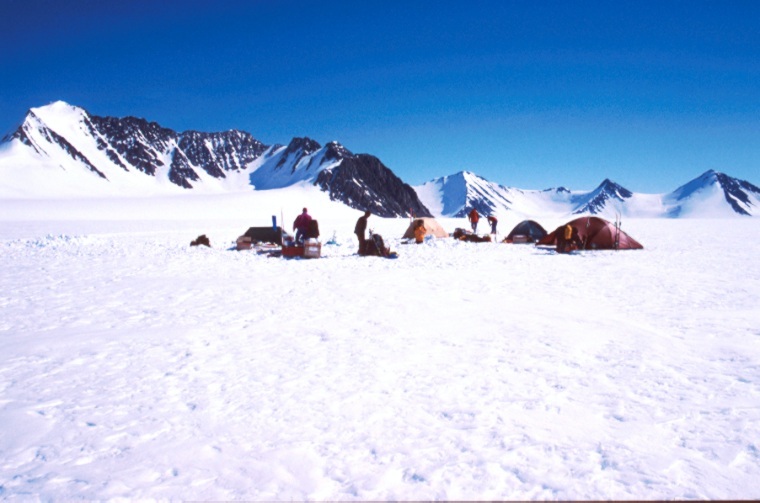 Base Camp, view to the north-east. 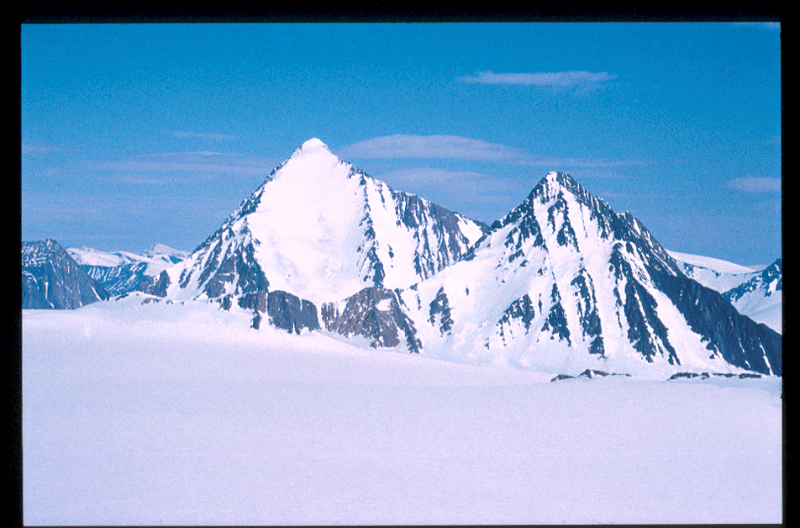 The three summits in the distance are from right to left, Birger Larsens Tinde, Larstind and Mehlums Tinde. Peterman and Little Peterman viewed from the west. Note the top part of the route with the exposure, Peterman rises about 1000 vertical meter. A GOOD VINTAGE, - An article published by Iain Smart in the Scottish Mountaineering Club Journal 1996. 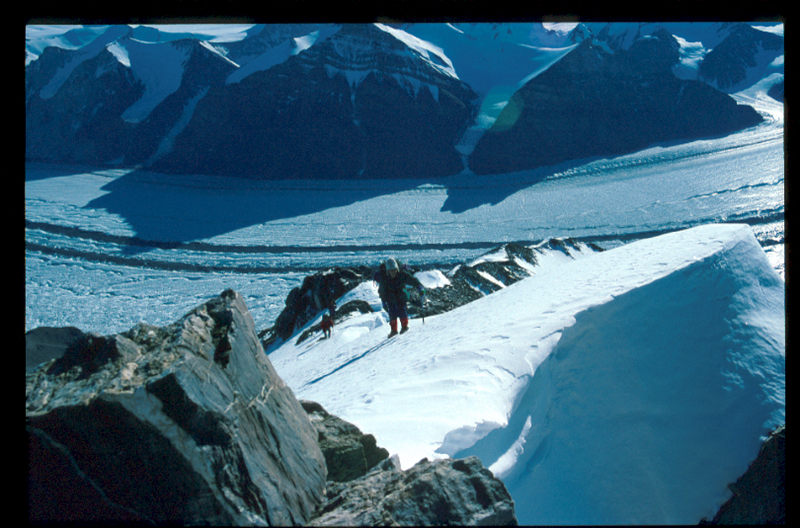 Reflections on the 1985 expedition to Peterman.